But in the meantime, I find myself wishing away the weeks, and waiting for the “better” days to come, rather than focusing on making TODAY happy. While it’s good to have goals and plans, I think many of us are living for the future, rather than the present. As cliche as it sounds, time comes and goes so quickly, and it is one thing we can never get back. I am making the conscious decision to make happy memories TODAY, rather than anticipating happy memories TOMORROW and in the future. What motivates me the most is that I don’t want to look back six months from now and remember all of the days I spent stressed and unhappy because of life’s present circumstances. If you allow yourself to adopt that mindset, once you reach your goal, you will be looking forward to the next step that will make things “better.” I printed off this quote as a constant reminder to be thankful for everything I do have and to appreciate the beauty all around me. 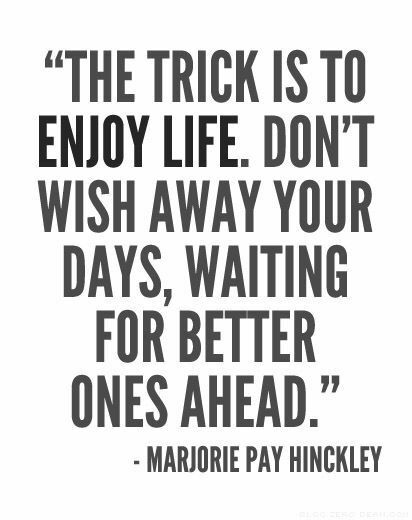 Do you have any strategies that help you to live in and enjoy the present? I think in the past year I stumbled upon the same realization as you: that it’s not worth wishing for better days, because our definition of better days always changes/upgrades. Just like you said! It’s hard to hit that spot where you’re all “ah, this is it, I’m totally satisfied.” There will always be another goal around the corner! And those days we *do* have are pretty fantastic. Once I decided to stop waiting I felt so much more settled and at peace. It’s like taking off a massive point off of your to-do list, haha. Exactly! It’s such a simple concept, but you feel so much relief when you accept and embrace being happy today. Thanks for your input! Great quote to live by – thanks for the inspiration! And love the blog!